I replaced my old K3 with another without loopers, which seems run well. Unfortunately, the internal lightmeter doesn't work. With my old K3 and working lightmeter, even everything say bad about it, I have always used getting a good exposure. I would like to try to fix it, the needle comes out if I move the knob of ASA, but it not move with light. Hopefully, I will use one external lightmeter. Are these below values good (from instructions manual)? Or is it the case that I look at the fps speeds on lightmeter? 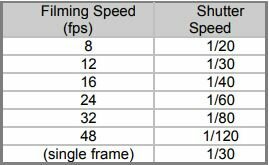 Those speeds reflect the actual shutter angle of the K3, so you should use them, but 1/60 at 24 is fairly standard for a fixed (non-variable) shutter. Yes, Mark, the K3 has a fairly standard shutter speed, as well as a certain tolerance, being a non-impeccable machine. For a personal whim, I would try to fix the internal lightmeter or have it repaired by someone, but the overhaul for K3 that I found are all in the United States, I would need it in Europe. Does anyone know one? Doesn't the meter require a battery? Have you checked that? If ya have, it's probably just a loose cable. The wiring is super thin and easy to break. If you peel off the front cover of the camera, you can expose the screws to take the front off and if you do, you'll see the wiring right there for the meter. Yes, Tyler, in the previous K3 I had the lightmeter working (with good result in film, strange! ), I also had the adapter for the right tension, bought from that specialized New York shop. I have already found a broken cable, very thin as you describe. It is the one that held the "peg" that draws voltage from the battery. Broken the cable, peg came out... And one. I'll have to open camera from the front as you say, but also from the plate, sure there is some other problem. However it did not seem to me a lightmeter difficult to repair, it is very "rough". A built-in meter is always going to be rather inflexible. Rather than pay for a repair, I'd get a decent light meter. Almost anything that will read incident light would do. The Sekonic L398 is probably the best for reasonable money. Of course, Mark, I already have pro lightmeters (Gossen, digital Sekonic, etc. ); as I said, it was just to have the camera complete in all its functions, but I would never spend high numbers to get it. I would only repair it for some coins, better always use the coupled K3 + external lightemeter, always!